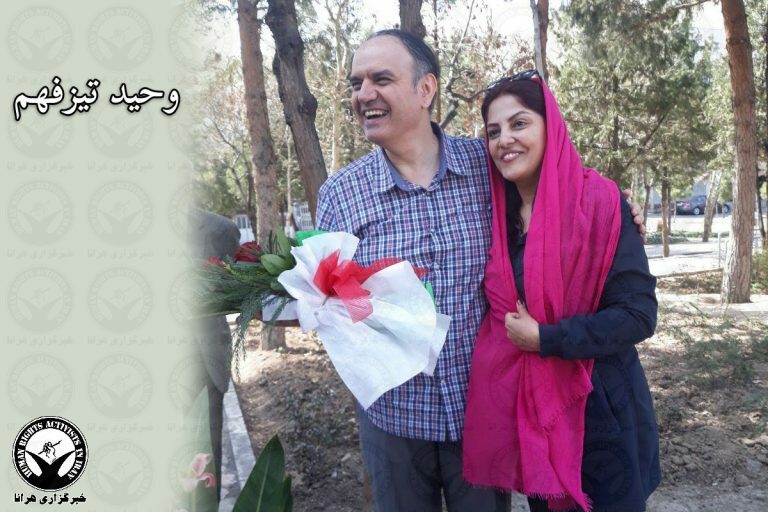 Vahid Tizfahm (وحید تیزفهم), one of the imprisoned “Yaran” (national facilitators for the Bahais in Iran), has been released from Raja’i Shahr prison, located about an hour west of Tehran. He has served a 10-year sentence for his work in serving the Bahai community in Iran. Six of the seven Yaran have now been released after completing their sentences, while Afif Na`imi (عفیف نعیمی) has been free on medical furlough since late October, 2017. The seven ‘Yaran’ served as national facilitators assisting the Bahais of Iran in their dealings with government organs until their arrest and imprisonment. They were appointed following the disappearance and execution of the elected leadership of the Bahais in Iran in 1980, and again in 1981. The elected leaders in many cities were also executed at that time, notably in Tehran, Tabriz, Yazd and Hamadan, where a total of 33 members of the local Bahai “Assemblies” were executed, in addition to the 18 members of the two national “Assemblies” and two assistants. In August 1983, the government declared the elected assemblies illegal. In accordance with the principle of obedience to government, the Bahais then dissolved all elected bodies. Nevertheless, seven former members of the national Assembly were arrested and executed. (see this Wikipedia article). National and local facilitators were later appointed, principally because government bodies needed to have a Bahai representative to discuss necessary matters and to transmit government instructions to the Bahais, which were not publicised in the media. One of the most important tasks of the facilitators was to arrange for Bahai burials, as Bahais are often barred from burial in public cemeteries, and Bahai practice requires a coffin, which is not allowed in many public cemeteries. On 5 March 2008, one of the Yaran, Mrs. Mahvash Sabet (مهوش ثابت) – a schoolteacher and mother of two – was arrested having been summoned to the Iranian city of Mashhad to discuss some matters regarding a Bahai burial. Two months later, on 14 May, the other six Yaran were arrested in raids of their homes. Mrs. Fariba Kamalabadi was one of these, the others being Jamaloddin Khanjani (جمال الدین خانجانی), Afif Na`imi (عفیف نعیمی), Sa`id Reza’i (سعید رضایی), Behrouz Tavakkoli (بهروز توکلی), and Vahid Tizfahm (وحید تیزفهم). After twenty months in prison without charge, a trial began on January 12, 2010, under Judge Moqayesseh (قاضی مقیسه, also spelled محمد مقیسه‌ای). Throughout their long wait for justice, the seven had received barely one hour’s access to their legal counsel, and suffered appalling treatment and deprivations, including psychological and physical hardship. They were charged with spying for Israel, propaganda against the Islamic Republic, and the establishment of an illegal administration – charges that were all rejected completely and categorically by the defendants. According to the defence lawyer, the charge of spying for Israel was based only on the fact that the Bahai properties in Israel are tax exempt. However Bahai properties are tax exempt in almost every country, and Islamic holy sites in Israel are tax exempt! The trial of the seven accused ended on 14 June 2010 after six brief sessions, characterized by their lack of due legal process. The initial sentence of 20 years imprisonment for each of the defendants, met with outrage and condemnation throughout the world. One month later, the appeal court revoked three of the charges, including that of spying for Israel, and reduced their sentence to 10-year jail terms. In March 2011, the prisoners were informed that their original 20-year sentences were reinstated. In November, 2015, the 20-year sentences were again reduced to ten years. Despite repeated requests, neither the prisoners nor their attorneys have ever received official copies of the original verdict or the ruling on appeal.